From left: Ed Philipp, Sugiyama Award Committee chair; Roger Kobata; Cheryl “Cheri” Morse; and Rev. Jonas Hayes, senior pastor of Grace First Presbyterian Church. 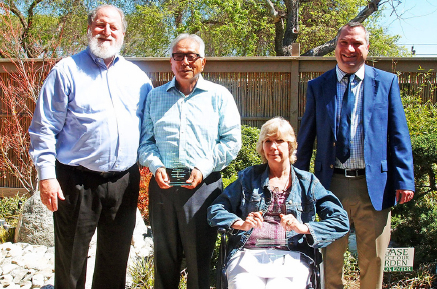 During a recent award ceremony, Roger Kobata of Cerritos and Cheryl Morse of Lakewood were presented with the 2017 Kimi Sugiyama Human Service Award, named after the late Kimi Sugiyama, a pioneering member of the Japanese Presbyterian Church (now Grace First Presbyterian Church) in Long Beach, who was a pivotal figure in the early years of the Japanese American community in the Long Beach area. In the 1920s, Sugiyama was a volunteer translator and committed advocate for labor and human rights of Japanese workers who had little or no understanding of the English language or American labor rights. During the past eight years, Roger Kobata, a professional landscape architect with Kobata Associates, Inc., in Artesia, has worked consistently and quietly with the Japanese garden planning group at Grace First Presbyterian Church to design the garden that ties the Japanese heritage of the former Grace Presbyterian Church to the current day. His guidance was instrumental in the final decision on the garden’s location, its design, the selection of each rock and plant, the lantern, the granite water element, the symbolic dry stream, the bamboo, and the red cedar gates. He worked tirelessly to obtain the necessary government approvals. He not only gave freely of his skills and time, but his attitude and sense of responsibility were incredibly valuable in giving confidence to the church committee members in making the decisions on this mission. Kobata’s service did not end with the garden’s completion. Each week, he and his wife Grace maintain the garden by cleaning, pruning, and planting, as needed. He is a tribute to his 101-year-old mother Haru, a long-time member of Grace First Presbyterian Church. She has always given of her time, her heart, and her resources freely. She has the ability to see the hidden need in others and is completely blind to her own needs. As a deacon at Grace First Presbyterian Church, she has shown great fortitude in caring for the sick and those in need by delivering meals, visiting members who are hospitalized, making numerous caring phone calls, and making gift tags for the COA, a homeless shelter in Long Beach, at Christmas and Easter time. Morse is creative in many crafts and works on anything needed for church events with skill and enthusiasm. She assists with many other endeavors as well. She has a wonderful smile and a friendly way that conveys to others that they are very special. Her family, and especially her husband Mike, support her in being the exceptional person that she is. Her devotion and commitment show brightly in her life of service to others.